This is an image restoration tool for the Photoshop PSD formatted images. PSD Open File Tool gives users of Adobe Photoshop an image restoration service that helps repair damaged Adobe Photoshop data files. It recovers and saves from corrupted PSD files of Adobe Photoshop. This application parses any version of Adobe Photoshop images. It supports even large files of the PSD format. This utility will let you preview all the layers of the file analyzed and will let you decide if the repair is adequate. Only then the restored image will be saved into a new file. The repair tool is really quite small and can be installed easily. It is compatible with MS Windows operating system, starting from Windows 98. 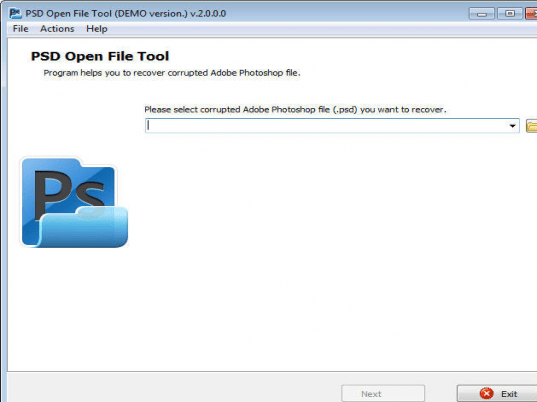 Even when the Adobe Photoshop is not able to open a corrupted file, you could use this utility to open the file through file open dialog box. The interface is simple and users could get comfortable with the program quite easily. The developers offer to help if users find it difficult to get any particular file opened. This tool uses a recovery process that is non-destructive. The original source is kept safe. If the recovery analysis is approved by the user, it saves an entirely new copy of the image. As soon as the processing of damaged file is completed, one needs to look through the regenerated image and compare with the original to make sure the recovery is complete. The analysis phase uses techniques and heuristics learnt over time and usually is able to catch most problems. Generating recovered image areas then is quite simple. This tool is compatible with Windows 98 and above. This is a handy tool and a good product. PSD Open File Tool is highly efficient data recovery program, supporting data recovery activities on PSD files of all available versions. This software successfully replaces some other methods of keeping the information in safety, in other cases it may become a good addition to other safety approaches, like regular backups. Very often, backups of really needed information are absent therefore you need other methods of repairing Adobe Photoshop illustrations and preventing the loss of critical data. PSD Open File Tool is exactly what you need to resolve the corruption of PSD files, moreover this intelligent and powerful service works on all computers running the MS Windows operating system. The size of PSD Open File Tool is approximately a megabyte that is why this application can be used on less powerful computers having slower Internet connection. The developer of PSD Open File Tool guarantees its safety because this service does not use some kind of additional data recovery services outside of the local area network of your company. It should be also noted that PSD Open File Tool does not modify corrupted images during the process of Adobe Photoshop restoration, it works with copies of input data to prevent the damage and destruction of PSD file in use. As soon as the processing of damaged file is completed, you should spend some time and look through the results of file repair by comparing the original data with its recovered replica. This software is all you need to keep Adobe Photoshop files in safety so there is no need to worry about the integrity of PSD files anymore. Hope it was not really complicated and you can now restart the analysis of selected PSD file from the very beginning, it should not take a lot of time if the document to be analyzed is relatively small.